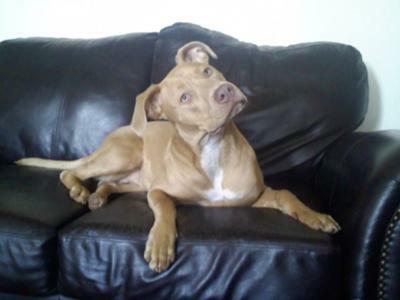 Coco is a 3 yr old red nose pit that i got off of Craigslist when she was just a month old. After bottle feeding her for a couple of days, she started going to the food bowl on her own and has been a fast growing strong girl ever since. She is obsessed with playing fetch and her favorite ball is a white lacrosse ball(the only kind she can't destroy). She has this incredible ability of sniffing out this ball no matter where it goes. I play fetch with her late at night in the park by my house with little to no lighting and she will always find the ball. She also likes to run with me when I bike ride. She's a great dog but she does have a mean streak. I've had to pull her out of several fights.....no major injuries to other dogs but she is extremely aggressive towards new dogs. I also have a pug who is older and is the alpha dog in the house....she is completely submissive to him. I love her to death!! Please please b very careful w/the lacrosse ball!!!! We had a rottilab that was obsessed w/his lacrosse ball! 1 say he & a couple kids were playing & he caught the lacrosse ball & got it lodged in his throat & choked to death! Those balls are hard & solid & when they are wet & slimy they are the perfect size for a full throat obstruction!! We learned the hard way that those are a very dangerous ball!! We hardly will let out play with a tennis ball just out of fear out pitties would do the same in there aggressive play to keep it away from the others!! So word of caution!! Lacrosse balls are dangerous!!!!!! A beautiful girl! She has a smart look in her eyes.. Responding to the Lacrosse ball comment....she's been playing with them for 2 1/2 yrs now with no incident thank god!! I don't throw the ball at her she fetches it and I also only let her have it while i'm playing fetch with her outdoors...indoors I put it away so I think i'll be ok! Thanks for the concern though! !